Click on dates to book your trip now! 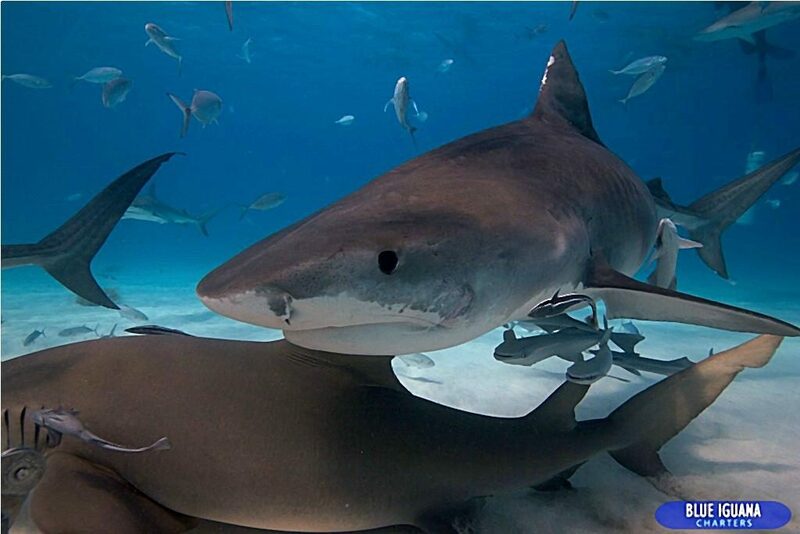 Join shark divers from America’s Shark Boat at Tiger Beach Bahamas for the tiger shark diving adventure of a lifetime. Tiger Beach in the Bahamas is perhaps the world’s best tiger shark diving location on the planet, renowned for its clear, calm waters and seasoned population of tiger sharks (Galeocerdo cuvier). Professional shark photographers, shark videographers, shark researchers and shark lovers alike rave about the ease in which you can dive cageless with this exciting shark species. Numerous additional species of shark also frequent this area, with opportunities to shark dive tiger sharks, caribbean reef sharks, lemon sharks, hammerheads and more. 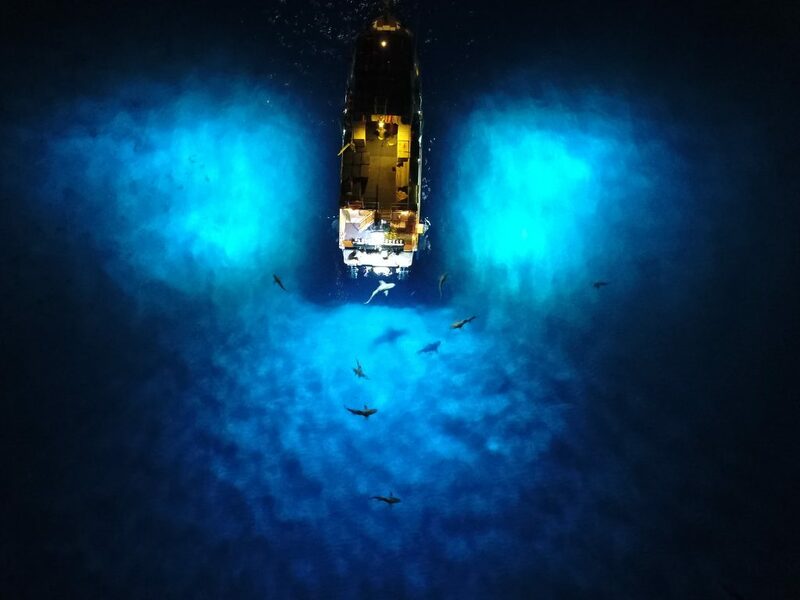 It is a shark divers dream liveaboard shark vacation. We have partnered with Blue Iguana Charters who has been diving this pristine shark dive site for the past decade. For three special weeks each year you’ll discover another whole new level of shark diving. If you thought cage diving with white sharks at Guadalupe Island was exciting, wait until you meet the 15 foot tiger shark named Emma at Tiger Beach. 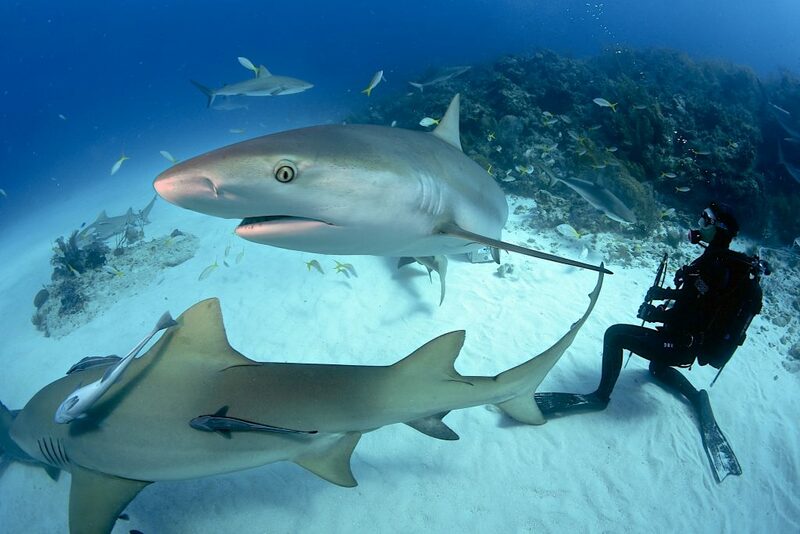 Tiger Beach, located on Grand Bahama, is the place to go if you want to experience a cage free dive with tiger sharks. The water is Caribbean clear, making it perfect for diving calmly and always being focused and aware of what is going on around you, which is vitally important when scuba diving with these sharks. Don’t forget to take your underwater camera gear with you to take photos and videos of these sharks in their natural surroundings. Many of the tiger sharks at Tiger Beach are well known among the world’s shark divers. Like Guadalupe Islands shark after close to a decade on this shark site the shark crews from Blue Iguana Charters aboard the liveaboard MV Kate have named them all. You’ll meet the female tiger shark Hook with her broken lower jaw. Hook had a run in with a fisherman and survived to tell the tale, but her shark jaw will never look the same.Tigers beaches star is Emma the tiger shark. Her giant size generally gentle demeanor and makes her a great shark to encounter in person. There are a few shark diving rules to follow while on these shark dives. This is not a comprehensive list, but to start off and as a matter of tiger shark diving respect don’t touch, ride or hug them, never turn your back to a tiger shark, a reef shark or a Bahamian lemon shark and if a shark is coming up behind a fellow diver let them know. Stay still and try not to stir up the sand, heavily overweight yourself and be steady on the sandy bottom. The shark of Tiger Beach in the Bahamas are fed pieces of fish that are usually white or silver in color so wear a dark wetsuit and gloves and keep your hands to yourself. Unless you really know what you are doing it’s a good idea to have something solid in your hand like a camera or PVC pipe to gently redirect a close, curious shark. We’re exciting to be joining forces with Captain Scotty Gray and the MV Kate next year and hope you’ll join us for a shark diving adventure to remember. If you thought cage diving with great white sharks at Guadalupe Island was fun…wait until you are face to face with Emma. Book today! Welcome to The Bahamas. Once you have arrived at our docks at Old Bahama Bay Marina, a Shark Free Marina, we’ll check you in between 5.00pm-7.00pm. Time to unpack and familiarize yourself with your floating home for the next week. Once you have settled in you are free to join your fellow divers at a local bar for some fresh Grouper Tacos, Conch Salad and a cool beer. Later tonight we’ll have an orientation on emergency procedures and shark diving information. We depart in the evening for our short cruise to “Tiger Beach”. This a great time to sit back and meet your fellow divers. The next morning will be busy with lots of diving. While your co-workers are drudging to work, you will be shark diving with Tigers and perhaps if conditions are just right a Hammerhead or two. This morning, we awake on Tiger Beach. The crew has been chumming since early morning. Tigers start arriving in the morning, typically we see anywhere from 1- 5 sharks, and they are hungry. Tigers are different from Great Whites in many ways. Here we’ll be in 15-30 feet of water with a sandy bottom. The shark diving operation will last all day long with regular shark rotations for our divers. If we feel like it or the action slows down divers can choose to run over to El Dorado where local populations of Caribbean Reef sharks swim close as you explore this reef. The game plan is to spend the entire day here where ever the shark action is the hottest. Note: Unlike Tiger Sharks, Caribbean Reef sharks and Lemon Sharks are considered a “safer” shark species. We do cage-less dives with these animals but always have a safety diver in place and do not chum on these dives if conditions dictate. The encounters here are completely natural and occur because these reefs are pristine. This is another full dive day with 5-10 dives at Tiger Beach. Wake up to breakfast onboard to the beautiful Grand Bahama Banks. We’ll make a run over to the “Bull-Pen” it’s a 60′ dive with Caribbean Reef sharks, groupers, eagle rays if the Tigers are not playing today. From there, we go to colorful Hogfish reef, then to Sugar Wreck for an afternoon and a night dive. We frequently snorkel & dive with large friendly turtles on this ancient wreck that was once a 330′ sailing vessel. Nighttime we anchor up in a calm area for overnight known locally as Dry Bar….it’s only a short distance from our Tiger shark site. Expect Tiger diving and lots of it if conditions and animals permit, this is the main reason we are here! More sharking at Tiger Beach this morning. Divers will spend as much time as they like getting shots and encounter time with these animals. We’ll be chumming all night long to keep interest high. This afternoon for a change of pace we are off to check out some of the crazy reefs that few people know about for some diving. Breakfast around 8:00 am with our first dive on The Mini Wall or Mt Olympus, a beautiful 60 to 90 feet dive. We often come across huge turtles, rays, flying fish, large game fish and other open ocean wonders whilst cruising. See colorful sponges, deep water fish, schools of Jacks and tropical fish. In the afternoon, we’ll make a run to a mini wall that ranges from 40-80 feet featuring big swim through crevices, sponges, and more schooling fish. This morning we will once again explore the ocean environment, spending the first part of the morning at Tiger Beach. If we would like, we can also run to another site for a good old fashioned Caribbean Reef shark dive to round out your last day with us here in the Bahamas. In the evening expect a local night dive, and a few Loggerhead turtles and a nurse shark or two. Last chance for Sharks. This morning we will once again explore the ocean environment, spending the first part of the morning at Sherwood Forrest for a Caribbean Reef shark dive to round out your last day with us here in the Bahamas.